Day Three – one group prepares their version of the ending of the Monkey & Crocodile story. 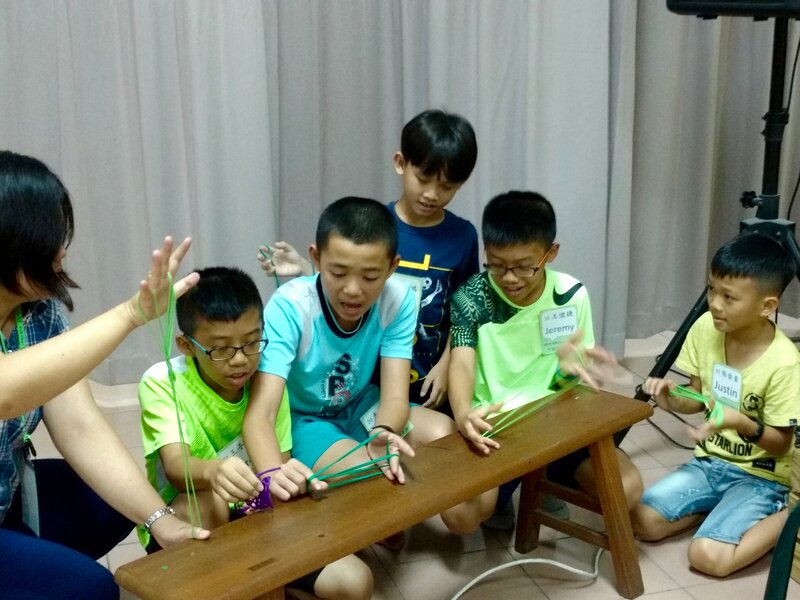 Sleep or no sleep, my job for 10 days is to lead these high-energy kids in Southern Taiwan in using string figures (think “cat’s cradle”) as shadow puppets. The heat is oppressive and the air is heavy in this industrial city. In the school, the walls disintegrate with mildew and damp; the occasional monster cockroach startles us; a rat passes me rather casually in the outdoor hallway; the bug zappers snap loudly when mosquitoes meet their fate. But the kids are smiling and greeting us in Mandarin and English. They are waving their strings, dancing down the steps around us, their eyes twinkling with sweet exuberance. They are eager to work with us — all day long! Today, I teach new figures, and tell the first half of the classic Indian tale about the monkey and the crocodile. I leave them hanging (Will the baby monkey fall for the crocodile’s trick and jump on his back?) and have them create an ending to the story, using string figures as “puppets” to act it out. The results are vastly more refined than what they did two days ago; the shapes more sophisticated, the work more focused. We also began experimenting with string shadows. 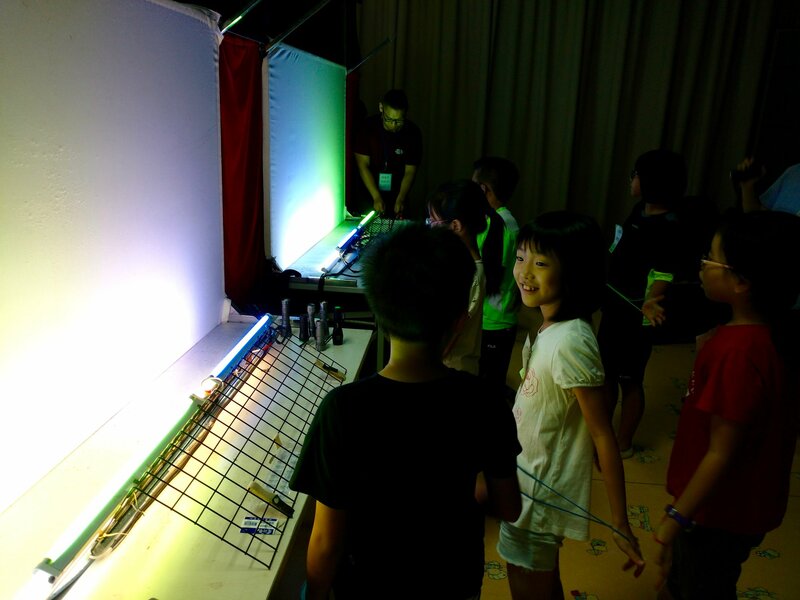 At the screen, they played with different string figures, varying the distances from the screen and trying different light sources. They took turns running around to the front to report back on what they saw. Finally, the students excitedly performed their own well-rehearsed shadow puppet show, depicting a legend from one of the indigenous Taiwanese cultures. They showed a high level of training and discipline as they sang, recited, acted in front, and operated a multitude of puppets and lights behind the screen. The choreography was intricate backstage, where everyone knew when to be in what position, who to let pass, how far to step back. It was very impressive. Although I bring my experience in performing with string figures, these young people clearly have their own expertise. Between now and Sunday, we will prepare a string figure – shadow puppet show to perform at the Kaohsiung Museum of Shadow Puppet. It’s going to be an exciting 6 days, even if the typhoon doesn’t land. The students ready to work at the shadow puppet screen. 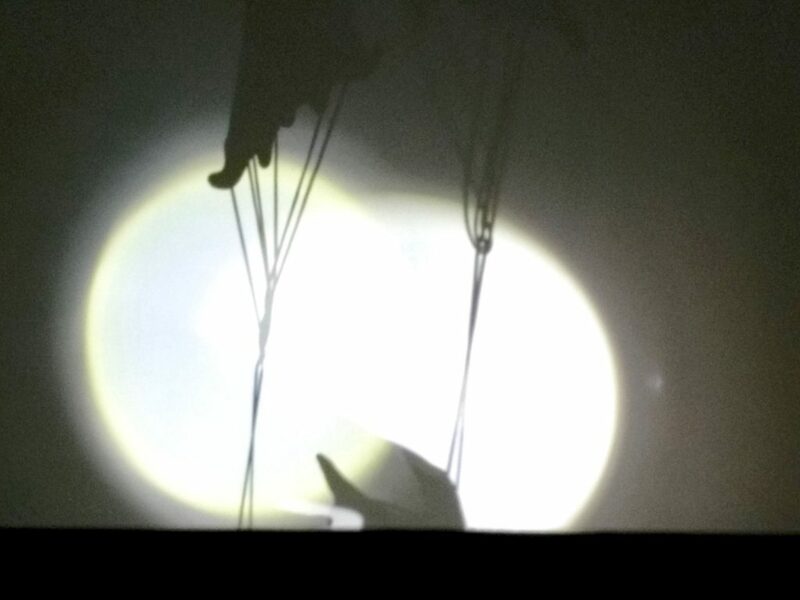 On Day Three we start experimenting with string figures on the shadow puppet screen, trying different shapes and different light sources. Here are two trees, lit by two flashlights.